The site of the first colonial settlement in Australia in 1788, when about 1400 men, women and children arrived after 250 days sailing in the First Fleet, a fleet of prison ships. Situated at the northern end of George Street, Sydney. Adjacent to Circular Quay and a short walk from the Sydney Opera House. The best way to explore The Rocks is on foot, as you wander the many lanes and old courtyards. ARGYLE CUT: connects Sydney Cove with Millers Point, started in 1843 by convicts with hammers and chisels, completed in 1867 with the help of explosives. ARGYLE PLACE: on the other side of Argyle Cut, at Millers Point, surviving intact with its little village green from the 1830s. THE EARTH EXCHANGE: an interactive geological and mining museum. Built in 1840 for the soldiers to attend services, still used today. 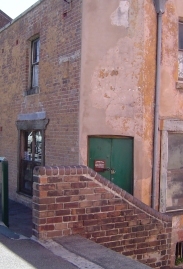 The oldest remaining hotel in Sydney. Built in 1836, of sandstone. Converted to a hotel in 1841. Beer brewed on the premises. HISTORICAL AND MILITARY MUSEUM: at the Garrison Church. Open Tues-Sat 11am-3pm, Sun 12-4pm. families in the mid 1800s, showing living conditions as they were then. Open Tues, Wed and Thurs during NSW school holidays. For group bookings open Tues, Wed and Thurs 10am-5pm. Highest point in the city. Signal station built on summit in 1848, later became the Sydney Observatory. Australia's oldest existing observatory. Exhibition showing the many constellations in the southern skies with explanation of their creation. Bookings for group and night visits essential. Every Saturday and Sunday, set up under a cluster of canopies under the Harbour Bridge, between 10am - 5pm. For general information on Sydney and NSW, brochures and maps. Accommodation, tour and booking facilities available. Exhibition and videos on history of Sydney. 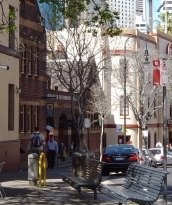 104 George Street, Sydney, with the former City Morgue below. International and local contemporary work.